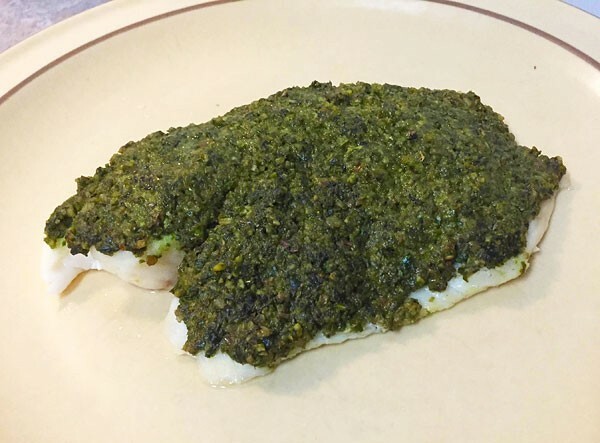 This nut pesto tilapia makes it surprisingly easy to enjoy a light, satisfying meal. When you want a light meal fish is a great choice, but I’m sure we have all gotten a little bored of tilapia. The filets are cheap so I cook them more often than other types of fish. The trick is to get creative and dress them up! I like to come up with different ways to top the filets to make the meal interesting. 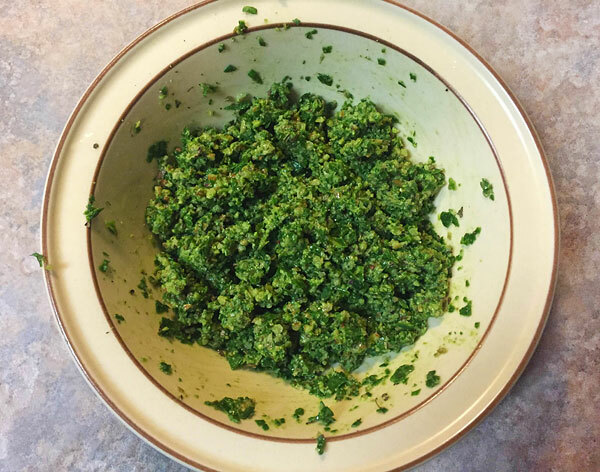 What better way than some homemade nut pesto? 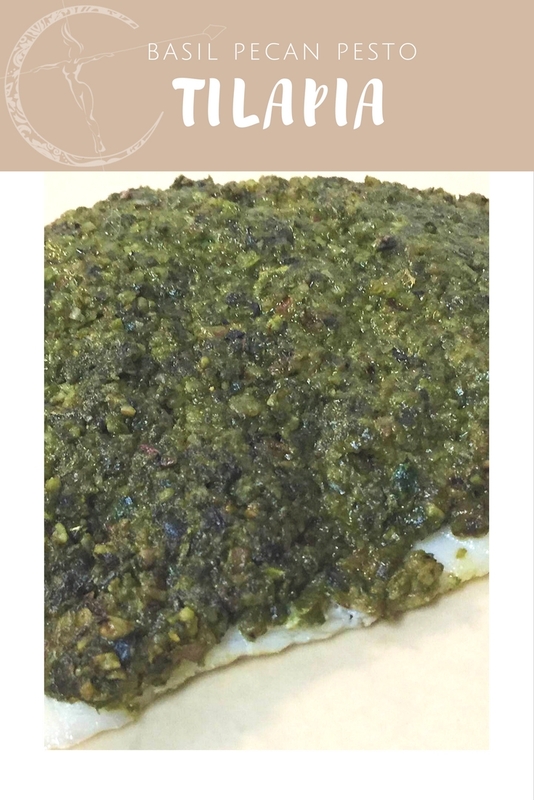 For this recipe I made a quick pesto to spread over the fish and it really transformed it from being so plain. I am lucky enough to have a basil plant in the backyard but you can find fresh basil at the store if need be! 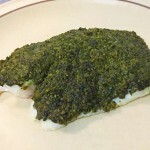 You will need a food processor to make the topping for your pesto tilapia. 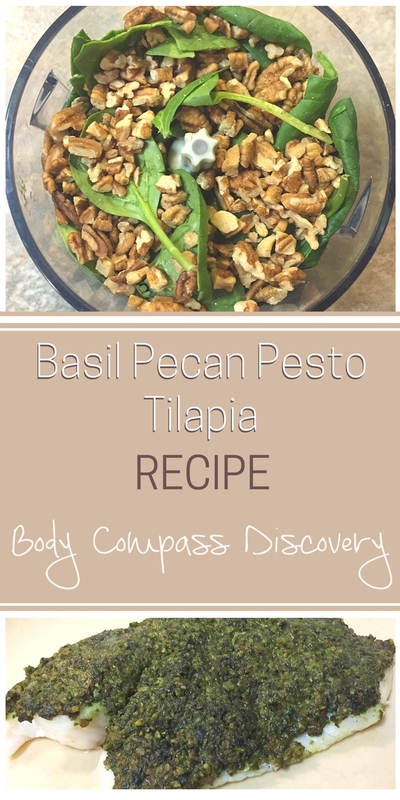 Put spinach, basil leaves and walnuts into the food processor for easy fine chopping. I highly recommend this brand if you are in need of a food processor. Guests comment on this one all the time and the best part is that it doesn’t break the bank! Once they are in a powder consistency spoon into a bowl and add in the olive oil and lemon. Sprinkle some pepper and then stir until paste-like. Lightly coat the tilapia with olive oil and place on foil on a baking sheet. Spread the pesto over the top of each filet until fully covered. Bake at 400F for 18 minutes. Make sure to test with a fork to see if the fish is flaky before you remove it from the oven. Enjoy the deliciousness! One of my favorite perks of this is that the pesto keeps the fish moist. 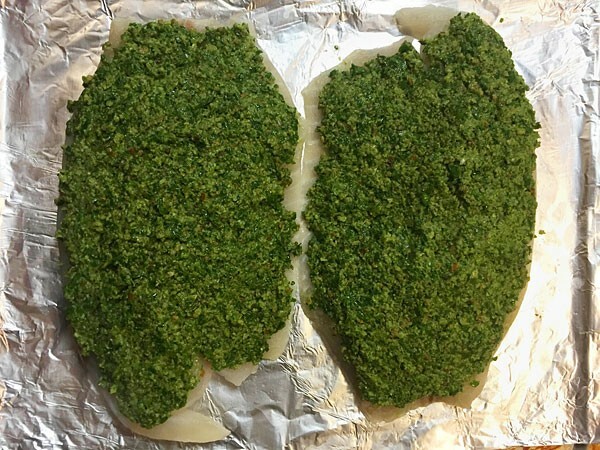 Baked tilapia with basil pecan pesto. 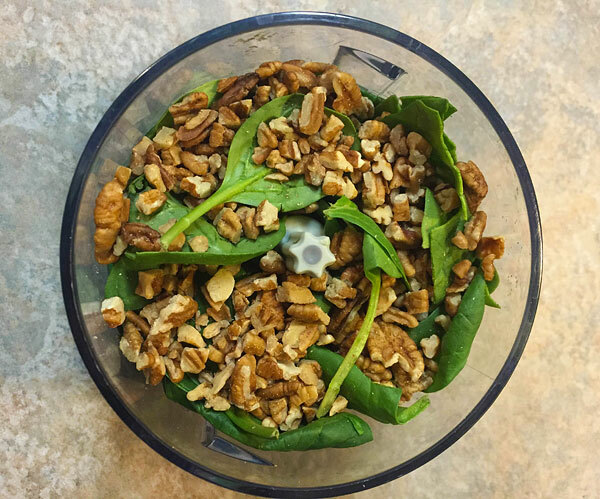 Put spinach, basil leaves and walnuts into a food processor. Once blended spoon into a bowl and add in the olive oil and lemon. Sprinkle some pepper and then stir. Lightly coat the tilapia with olive oil and place on foil on a baking sheet. Spread the pesto over the top of each filet. Bake at 400 for 18 minutes. Once cooked remove from oven and serve! This one came out very successful, so I’m definitely looking forward to making tilapia this way again! I’m sure the pesto coating would work for any other type of fish just as good if you want to give it a try. >>This is a Whole30 APPROVED recipe! Oh yum, this sounds delicious! It’s funny you say everyone should be sick of tilapia, I have noticed it everywhere since moving to the states, but didn’t see it once when I was living in Australia, so it seems almost exotic to me 🙂 I love the addition of pecans, they can spruce up any dish IMO!! Oh how funny, that’s really interesting to know- and I’m jealous of where you used to live haha!